If you would love a weight loss plan app that everyone is talking about for your Android or iOS device then please let us explain a few details about “hCG Diet App”. Before we let you know about all of the features we must tell you that this application is not a generic diet app but one that will allow you to keep track of your protocol step-by-step. 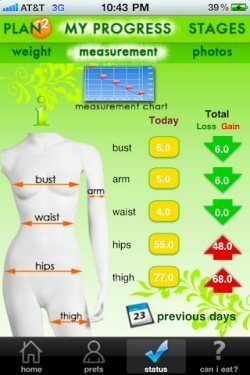 This is a great weight and diet-tracking app. Main Features Include: Daily tracking on Home Screen, hCG will allow you to set reminders for injection/sublingual or drops up to around 5 times a day as set in preferences, you have the ability to store photos in all stages, Notes with checkboxes to quickly find where and why you lost or gained weight, you can tag and even email photos from each stage, get real-time start and end date tracking, plus Easy to follow reminders about each stage of the protocol. Other Features Include: Progressive weight loss graph that is editable, Progressive measurements graph that is also editable, Notification Reminders even if you handset or device is in sleep mode, create custom meals every day from allowed foods, plan each weeks meals ahead of time, a great menu page that will list your daily proteins and fruits along with an hCG reminder box, Dr. Simeon’s Pounds and Inches as a reference guide & AUDIO BOOK, plus vegetarian food allowances, automatic shopping list created from what meals you have planned organized by week, password protection so no one can tamper with your process and current and extensive food database created by people who have been on the protocol. 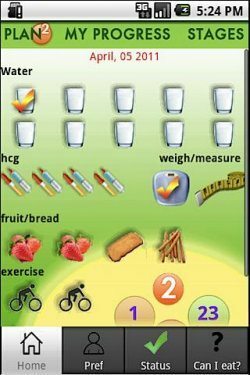 If you would like hCG diet plan app for you android (Â£8.06) device then please visit the Android Market and download now, if you would like the app for iOS devices (Â£7.49) then please visit iTunes.